I don’t own a copy of this issue of SUPERMAN today, so I’m pretty sure that it was traded to my next door neighbor Johnny Rantinella at some point, as happened occasionally with our comics. But I do know that I bought it from my regular 7-11 when it came out. This was another key story in writer Elliot S! Maggin’s career. 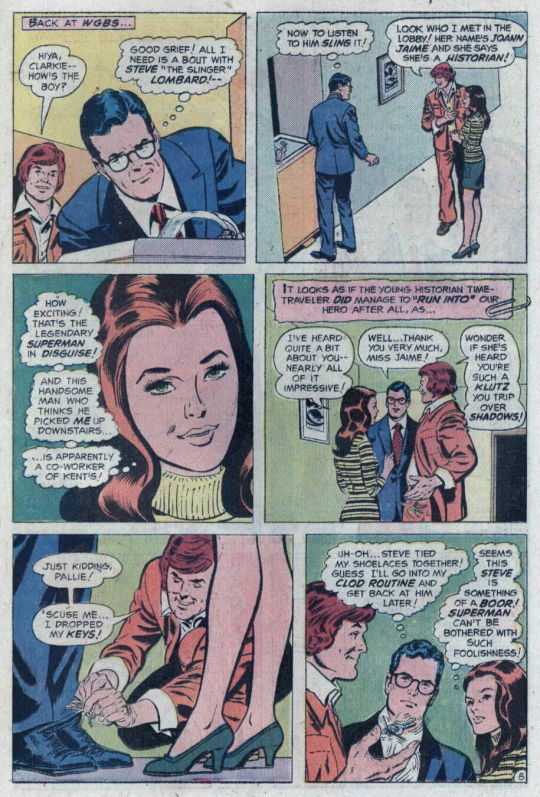 Elliot would reuse elements from this tale on a number of occasions, including in his SUPERMAN novel Miracle Monday, as well as his later Superwoman stories. There were definitely ideas herein that resonated with Maggin, though this first version is really nothing special. He’d make more effective use of them later on. The issue opens in the far future of the year 3475, on the even of the 1500th anniversary of the “Miracle of Thirsty Thursday.” And historian Joann Jaime is preparing to be sent back to that date to observe these events firsthand. Her adviser, though, suspects that her true objective is to meet the Man of Steel, as has been the case with so many others they’ve sent back to that era over the years. 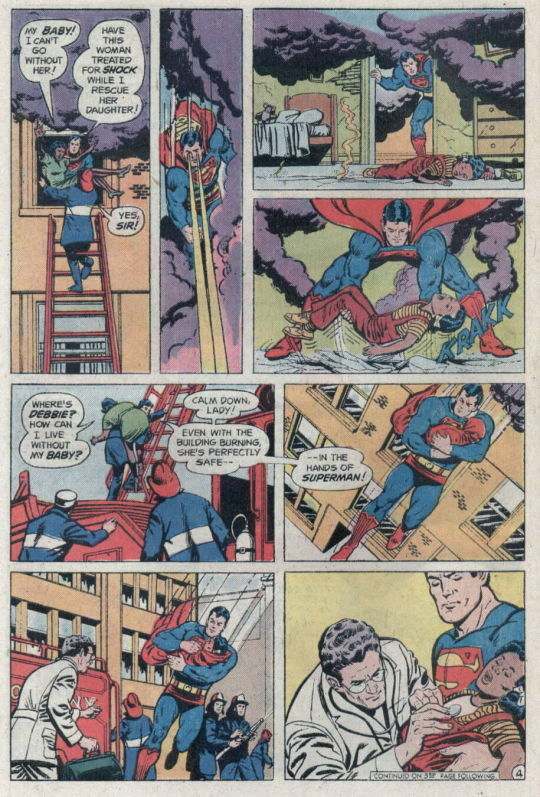 The action switches to the present day, where Superman helps firefighters combat a blaze, and he saves a young mother and her daughter from certain death. Meanwhile, over at STAR Labs, researcher Larry Ishmael is working on a food substitute that is added to water, when he accidentally drops his samples, and they become a fast-acting vapor. Ishmael himself is transformed into a raging beast-man, and all across Metropolis, people are experiencing a pathological aversion to water–to the point where fire-fighters won’t use their hoses. 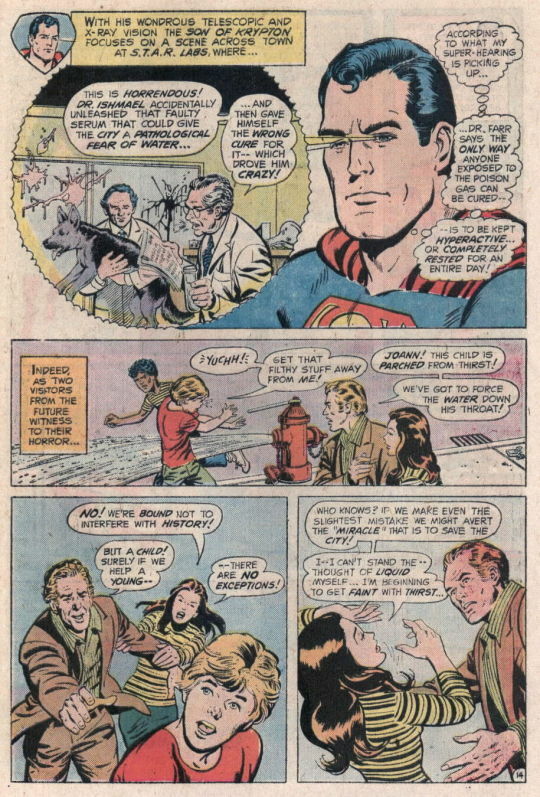 Clark becomes Superman in time to put out another blaze, but he’s swiftly attacked by the out-of-control Ishmael, while Joann watches from the crowd. 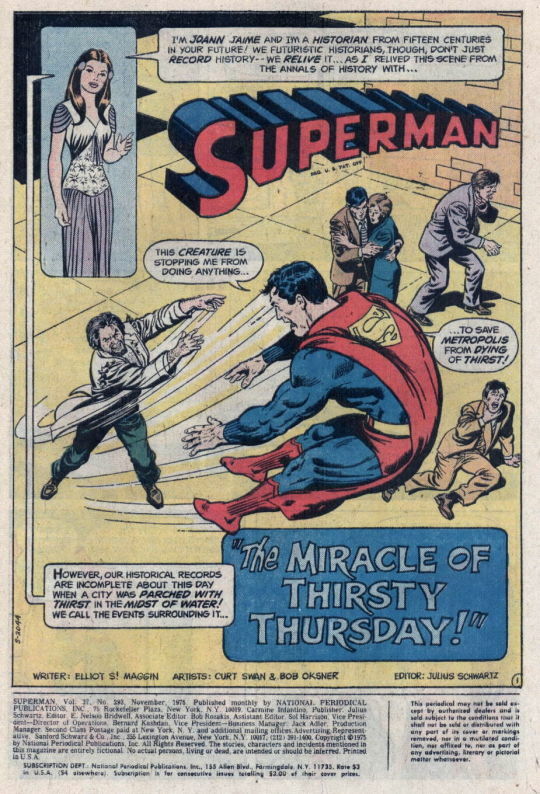 Subduing the crazed scientist, Superman uses his super-senses to learn that the cause of the water-phobia is the serum Ishmael had been working on–and that the only cure is either complete rest for 24 hours or complete hyperactivity. 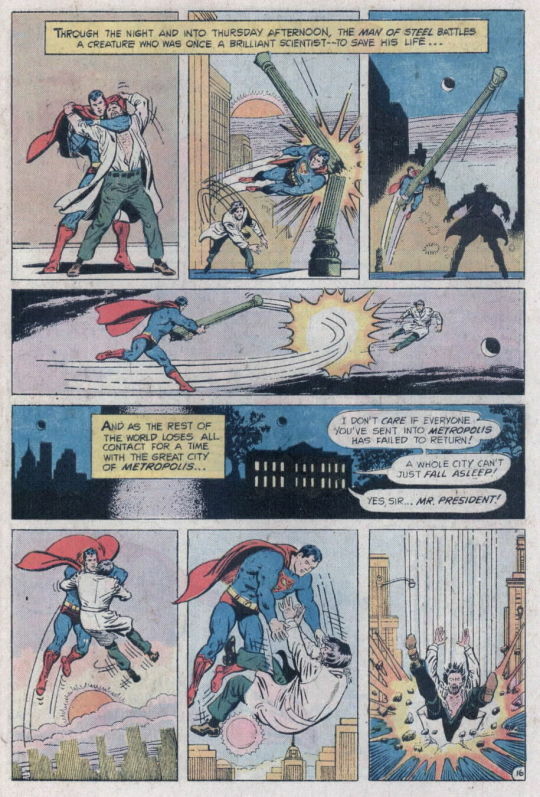 Superman uses his heat vision to puncture several canisters of sleeping gas stores for some reason under Metropolis, creating a gas cloud that puts everyone in the city to sleep–except for Ishmael, who in his beast-form is immune to the effects. In his case, the Man of Steel keeps him fighting all day and all night, to maintain his hyperactive state and carry him through the crisis as well. And so, the city is saved, but the details of what caused the problem need to remain a closely-guarded secret. And so we cut back to the year 3475 as Joann gives her report. 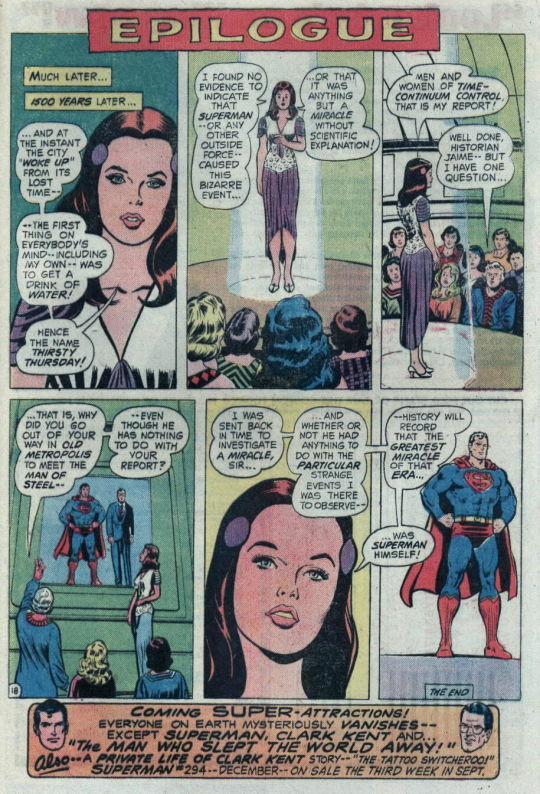 Having been a completely irrelevant participant in the events of the story, she also has no idea what truly went down, and so she concludes that this was a legitimate miracle, one that is shrouded in mystery and which Superman had nothing to do with. It seems like Maggin was trying to make a point about the accuracy of reported history and even archaeology–I wonder what event or events in 1975 might have inspired this story–but it does mean that there are swaths of this story that are pretty pointless. Fortunately, Maggin’s do-overs with these ideas later on would be more effective.